Tuscarawas Coordinated Public Transportation TuscTransit is a coordinated effort between SEA (Society of Equal Access), Horizons of Tuscarawas & Carroll Counties Inc. and Tuscarawas County Senior Center. This coordinated effort started because Tuscarawas County is a rural county and did not have public transportation. 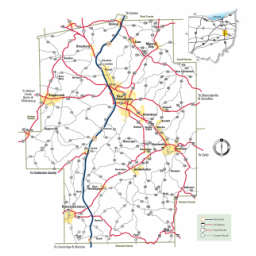 As of January 1, 2017 Horizons of Tuscarawas & Carroll Counties Inc became Rural Public Transportation Provider.This effort has been made possible by Tusco Bus Advisory Board, Tuscarawas County Commissioners and ODOT Office of Transit. With 48 hours advance notice, transportation is available for many purposes - doctor's offices, hospital treatments, school, employment, shopping, recreation, and other purposes. Pickup can be arranged at any location in Tuscarawas County, and transportation may be requested to and from any location in the county. If you have any special requirements, please mention them when making a reservation. For transportation outside of the county, please inquire. Who Uses This Transportation Service? Tuscarawas County receives grant funding from ODOT Office of Transit to support programs in our county that help with transportation of our residents. and local match monies to cover expenses not paid for through ODOT grants. c/o Horizons Inc. 220 W 4th Street Dover Ohio 44622.